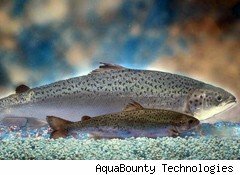 As the Food and Drug Administration considers this week whether to approve the production and sale of the first genetically modified (GM) animal -- Atlantic salmon -- for human consumption, much of the public and media attention around the question is focused on the how the so-called Frankenfish will be labeled in grocery stores. Some in the seafood industry are urging the government to require that the biotechnology origins of the fish be spelled out in product labels. Its developer, AquaBounty, and others in the biotech industry argue that such labeling would make consumers believe that the meat from genetically modified fish is scientifically different than that conventional variates, which they assert isn't true. "Food labeling is intended to provide information on product composition and safety," according to the company. Since fish grown from AquaBounty's AquAdvantage eggs is "nutritionally and biologically the same as any other Atlantic salmon the consumer purchases, there is no reason for it to be labeled as different." The stakes are high. Salmon is the third most popular variety of seafood sold in the U.S., behind shrimp and canned tuna, according to the National Fisheries Institute. The vast majority of the fish sold in the U.S. -- some 70% -- comes from fish farms. The Wall Street Journal reports that the U.S. consumes about 450,000 tons of Atlantic salmon annually, most of which is imported. Wild stocks in this country's waters have been depleted by years of overfishing, and U.S. fishermen are unable to meet consumer demand. But producers in countries such as Canada and Norway have had "their best years in a long time," according to John Sackton, editor and publisher of Seafood.com. Though GM food has not gotten the same level of negative publicity in the U.S. as it has Europe, there are plenty of domestic critics. Whole Foods Market (WFMI), for one, won't stock genetically modified seafood, says Libba Letton, a spokeswoman for the Austin-based company. If consumers get worried about AquaBounty's planned product, and if there are no labels to make it easy to tell the difference between GM and non-GM varieties, the results could be disastrous for the salmon industry. "It's going to inflame consumers' suspicions of all salmon," says Sackton, who notes that the salmon industry is much smaller than that of other foods such as beef or chicken. " In my opinion, there will be less people eating salmon." Indeed, the International Salmon Farmers Association is against the commercial production of genetically modified fish until it is declared safe by regulators and there is a market demand, according to a spokeswoman. U.S. Sen. Mark Begich (D-Alaska), whose state has a $400 million salmon industry, declared that the GM fish is a "risky precedent, a threat to Alaska wild salmon, and comes with little if any public input." The threat to which Begich is referring to is that of farmed salmon escaping into the wild and breeding. AquaBounty, which is based in Waltham, Mass., argues that it has solved this problem: Its fish are all female and sterile and it keeps them in isolated tanks. But according to Sebastian Belle, executive director of the Maine Aquaculture Association, the sterilization technology is not foolproof and some fish are bound to escape from facilities. "We don't have any interest in using GMO salmon," says Belle, whose state is the largest center of salmon farming in the U.S., in an interview. The industry wants the FDA to "slow the process down," he says. The Center for Food Safety has complained that the process being used by the FDA is designed for veterinary drugs. It adds that more than 300 environmental, consumer, health and animal welfare organizations, along with salmon and fishing groups and associations, food companies, chefs and restaurants have signed joint letters to the FDA opposing the approval of genetically modified salmon. AquaBounty has repeatedly argued that consumers have nothing to fear from fish grown from its AquAdvantage eggs, which are Atlantic salmon eggs with an additional gene from Chinook salmon and one from the ocean pout. It is well aware of the dust-up over labeling. "Voluntary labeling is sometimes acceptable, but would be the responsibility of the fish growers," the company says. "AqcuaBounty is happy to make 'good stewardship' labeling guidance available to the aquaculturists that buy our products. We would recommend that they also identify the environmental and sustainability benefits of the product in their label." The FDA's 60-day public comment period on the labeling issue will be open until Nov. 22. After that, even if the FDA gives the go-ahead, AcquaBounty estimates that its salmon won't reach the market for two to three years. Meanwhile, the GM food industry continues to grow as the use of genetically modified seeds increases. And regardless of how the salmon question plays out, the technology will continue to improve, and the debate will continue. Coming soon, the "Frankenswine." As The Wall Street Journal notes: "Scientists at the University of Guelph in Canada have created a genetically modified pig that can better digest and process phosphorus, reducing production costs."